Malahide Castle, parts of which date to the 12th century, lies, with over 260 acres (1.1 km2) of remaining estate parkland (the Malahide Demesne Regional Park), close to the village of Malahide, nine miles (14 km) north of Dublin in Ireland. 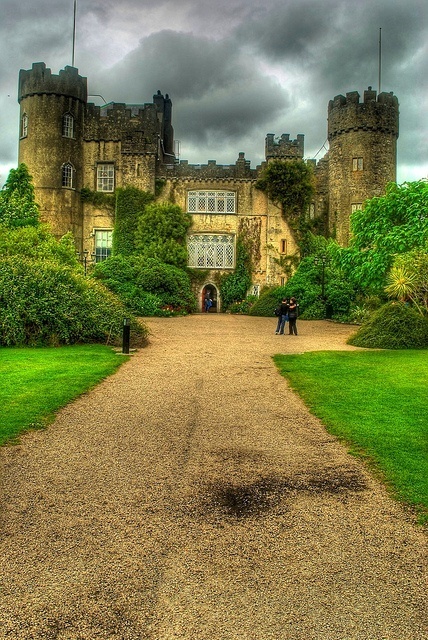 The Castle, along with its subsidiary attractions, was for many years operated as a tourist attraction by Dublin Tourism, working with Fingal County Council, which owns the whole demesne. The operating partner is now Shannon Development, which has in turn appointed subsidiary partners, including Avoca Handweavers.The main castle can be visited for a fee, on a guided-tour-only basis. In addition, it is possible to hire the famously gothic Great Hall for private banquets. The castle has an eating facility, and adjacent is a craft shop. The castle's best-known rooms are the Oak Room, and the Great Hall, which displays Talbot family history.